I'm a mom and writer trying to find a way to do it all. 2. 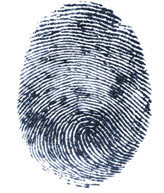 Fingerprints are identified using three patterns: whorls, loops, and arches. 3. No two fingerprints are alike even on identical twins. 5. The AIST (Academy of Investigation Services & Training) offers a fingerprint identification course. 8. Normally, when you injure a finger, the same fingerprint pattern appears on the new skin. If you damage the inner skin layer, you may have a new fingerprint pattern. First and foremost, I'm a Mom. My second passion is books. I love mystery/thriller/suspense novels. My first novel, Unraveled, was released Spring 2013 from Evernight Teen. The sequel, Uncovered was released in July 2014. I have a MFA from Seton Hill University.